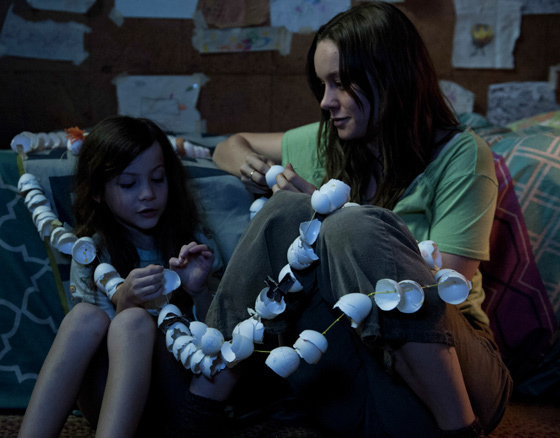 Much of the hype surrounding Lenny Abrahamson's adaptation of the Emma Donoghue novel, Room, revolves around the lead performance from Short Term 12 actress Brie Larsen, who initially turned heads a few years ago in the short-lived but highly entertaining Showtime series, The United States of Tara. Here, she plays a young woman trapped in the titular "room" — a reinforced garden shed with only a skylight to suggest an outside world — with Jack (Jacob Tremblay), her 5-year-old son. Since Jack's disposition is that of childlike wonder, hinting only at the situation through a genuine inability to conceive of a world outside the room, we're left to interpret what's happening to Larsen's reactions. She's worn down. She obviously cares about her son and does her best to educate and engage him, but she's inhibited by the limitations of their surroundings, not to mention afflicted with a chronic, painful toothache. We quickly learn that the pair have been in this room for most, if not all, of Jack's life and that nightly visitations from Nick (Sean Bridgers) are volatile, threatening events that Jack is sheltered from only by a curtain. Without any exposition to contextualize the situation, it's Larsen's portrayal of a deeply wearied, but not defeated, woman desperate to free her son from this cage. Her frustration, devastation and desperation are palpable, immediately engaging us in her plight and generating an unnerving level of tension whenever she attempts to manipulate her captor into letting down his guard. But, beyond this central performance, which is the sort that helps jump start a long career, Abrahamson's knack for capturing the intimacy of the situation and the surrounding minutiae — in particular, the complexity of Jack's distorted and naïve worldview — ensures that Room is consistently compelling in both an emotional and visceral capacity. He also has an affinity for capturing the uncertainty and fear of an emotionally stunted child with limited social skills, which heightens one of the tensest, most anxiety-inducing sequences in recent cinematic memory. It's at this point that this engrossing thriller transitions into an effective drama about social acclimation and the burden of tragedy. Where a traditional story would begin and end with the central motivator and framing device — escaping the room — this clever, psychological human drama knows that physical escape is really only the first step of many in being freed from captivity. And where most stories would struggle to balance the tonal transition from thriller to intricate character drama, Abrahamson and Donoghue keep everything aligned by filtering it all through the eyes of Jack, whose hope, curiosity, fear and need for stability give a consistently touching sense of humanity to the many deeply troublesome but realistic reactions they have to the situation. All of this results in a film that is never less than captivating. Even when Room doles out a wrenching punch to the gut, tackling the sense of grief and isolation there victims feel, along with the sense of displacement and miscommunicated concern that those around them show, it's never exploitative or strained. Everything about Abrahamson's comprehensive work feels deeply considered, meaning that every reaction, as contradictory, occasionally explosive and raw as they may be, present logically without any superfluous histrionics. And beyond the central premise, there's a deeper sense of existential meaning, exploring the concept of how to remain good and hopeful in a world capable of illogical and unanticipated evils. Beneath all of the shrewdly presented human interactions and obstacles that Room confronts, there's a deeply identifiable sense of uncertainty that stems from trying to make sense of chaos, which touches on the root of the human condition.